This story was reprinted with permission from The Lens, New Orleans area’s first nonprofit, nonpartisan public-interest newsroom, dedicated to unique investigative and explanatory journalism. The original story can be found here. The same can be said of the increasingly infamous New Orleans Sewerage & Water Board. Let’s go way on back when. Back to August 2015 and the beginning of one customer’s ordeal. Mine. August 2015 is when I first noticed that the sidewalk in front of my house was sinking — radically — and that the sinking was causing cracks and fissures to appear in my house in the city’s Hollygrove neighborhood. Not the wear and tear normal with an old New Orleans house, this was something more, something I couldn’t ignore. I contacted the S&WB, also Mark Jernigan, then director of the the city’s Department of Public Works. In an email dated September 9, 2015, a S&WB deputy director named Robert Miller told me they had investigated the matter and “did not find any failure of the Sewerage and Water Board facilities.” Um, but they did determine from dye test results that municipal water was leaking into the stormwater drain. Great! Whatever! And so you’re going to fix the problem before the sidewalk collapses completely? Right? For several months my emails asking when the work would start disappeared into the void. Then in March 2016, I heard from Jernigan. He was still director of Public Works. (I was still me and swiftly turning into a barking watchdog.) He advised that, though incommunicado, S&WB had reached some sort of agreement regarding the repairs. But the cost estimate was sky-high: $180,000. Jernigan said he was waiting on results of a second analysis to see if the price could come down. The construction began, an aggressive replacement of the storm drains that run under the sidewalk, drains so clogged with tree roots and debris that water was busting out of them and scouring away the earth around the foundation of my house as well as other houses on the block. It was ugly, it was muddy, and, with each passing day, the contractors grew to dread the dog’s bark as she attempted to cross the Grand Canyon on her way in and out of the house. But hey! It’s getting fixed, I thought. May 2016: The work crew departed. The job was done, right? More than done, you might say. Where the front of my raised cottage had once featured a patch of grass and shrubbery alongside a driveway leading to a rarely used one-car garage, I now had a vast slab of concrete suitable for the two-car garage I don’t have. Oh, well. A concrete pad was better than a a sinkhole, right? (And you never know when you might need to put the pedal to the metal and try driving the family car up a steep set of stairs and onto a second-story porch.) Once again I barked and the concrete was removed. In February 2017 I noticed that my S&WB bills were out of whack. Way out of whack. They were double what they had been. As the kids today would put it: I have the receipts. I checked for leaky faucets. I scouted my backyard to see if my home had become lakefront property since the last time I was out there. So far as I knew, no crevasses had opened in the earth above the new storm drains. Not a single visitor trying to enter my house had been sucked into a swirling eddy and carried off screaming to her death. The problem turned out to be simple, if surreal. The contractors had buried my water meter under the concrete pad, then forgot to excavate it when they removed the unwelcome concrete. Without access to the meter, their wacky bills had been guesstimates. You will think me a fool, but despite delays that had eaten up half a year of my life, I still believed the problem would be resolved promptly. The meter would be excavated and the billing straightened out. A simpler time for sure, a happier customer. But while my house was no longer sinking, my bill continued to climb toward the heavens above. To be precise, by September 2017 in spite of making my “normal payments” as advised, I was hit with a bill for $1,007.22 . So I disputed it again. Surely, once the buried meter was unearthed, the whole mess would get cleared up. 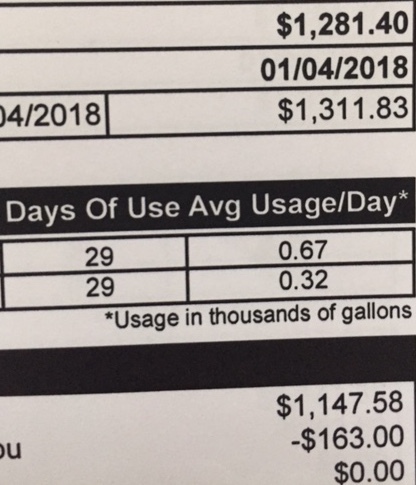 The water-use estimates would be trued with our customary levels of consumption and my bill adjusted accordingly. How wonderful it would be to stop worrying that the S&WB was going to force me into foreclosure or bankruptcy. Soon I would be able to think again about other things — like my life, my work, my family. But I did worry, and I do worry. My subsequent bills post-September 2017 came marked with “Important Information.” It said, “Previous bill totaling $948.58 is under investigation.” No idea what aperture in the human anatomy they pulled that $948.58 from. But I tried not to worry. Surely S&WB would get its act together. Someday. Meanwhile, I decided to request copies of all my bills from 2017 to the present. Auditing my own account had all the appeal of a self-administered root canal, but if S&WB couldn’t get around to doing it, I guess it was going to fall to me. For example: In March 2017 I owed either $149.95 or the SWB owed me $849.15. And so it went for a year, except for the months when they couldn’t generate any bill at all, the months when I called and requested the bill and they told me I should go down to the post office and complain about not getting one. So here I was with two sets of bills that looked like something Mafia consigliere Tom Hagen might have cooked up in the “Godfather” — except that in the movie one of those sets of bills might actually have been correct. In early June, S&WB finally came out and replaced the meter they had buried. The result of that visit was on my next bill: $650.00. Oh, and the Mississippi River changed course and began running down my street, a fresh leak from the obviously faulty new meter. The tenor of my communications from the S&WB changed suddenly. I was no longer a customer entitled to courtesy because of a bureaucratic snafu. I was a scofflaw, a filcher. S&WB began threatening me. Pay up or else. I was in the limbo where some 17,000 New Orleanians now reside. Maybe I should start to worry after all? Finally, I am stripped of all illusion. I no longer take foolish comfort in promises that S&WB is on the case and will (someday) climb out of its bureaucratic, technological and infrastructural sinkhole. No one is “investigating” my particular problem. No one over there is even listening. And Jernigan is no longer running Public Works. He was forced out after the disastrous floods a year ago this month. A week or so ago, I called to report the leaking meter and the river flowing from it. Emergency? What emergency? No crew shows up. I decide to attend the August meeting of the City Council’s utility committee. A meeting slated specifically to address the service shutoffs threatened by the S&WB. As a journalist, I am normally a fly on the wall at public meetings. I take notes. I keep my mouth shut. I observe the line that separates reporters from aggrieved citizens. On this occasion, I am both. I can not be silent. I get up to speak. I want to keep it simple, so I speak mostly about my inability to perform an audit on myself because the two sets of bills S&WB sent me directly contradict each other. I email Robert Jackson, S&WB’s Director of Communications and Intergovernmental Relations, a friendly and likeable guy I’ve dealt with over the years as a journalist. I am told someone will get back to me, and someone does. But not with any answers. Jade Brown Russell, then still the S&WB’s acting director, said someone would get back to me. The call from S&WB came Friday at 4:55 p.m. (I looked at my watch: I’ve gotten a little uptight about keeping details in proper order when dealing with the S&WB.) A woman with S&WB said they were going to send someone out to check on the leaking meter, the mess I reported more than a week earlier. And my bill? The S&WB employee had nothing to say about that mess, other than offering assurances that my service wouldn’t be disconnected while they “investigate.” Knowing what I know, I had to tell her the assurance rang a little hollow. When you’re dealing with the S&WB, there is no there there. My greatest fear, not just for me but for all the rest of us swamped in this inexcusable billing nightmare, is that there will turn out to be no bottom to the S&WB’s sinkhole of bureaucratic dysfunction, no bedrock on which a subsiding city agency will finally be able to shore itself up and put its house in order. S&WB’s hope, obviously, is that bullying and threats will convince enough folks to cave in and pay our inaccurate and improbable bills, thus rescuing the agency from imminent financial collapse. But temporary solvency won’t cure the deeper problem: incompetence — the incompetence that had pumps out of service during the August 2017 flood, the incompetence that triggered a fire (or overheating) at a generator needed to get those pumps working again, the incompetence that has made S&WB bills exercises in not-very-believable fiction. Meanwhile, the ranks of aggrieved S&WB customers continue to swell. I read you on Twitter and Facebook. I see you at meetings, trying not to pull your hair out. I read your emails and feel your pain. The S&WB had decided its top executives needed and deserved a pay raise. Job well done, gang! On top of six-figure salaries, the raises in and of themselves were more than the median income of the average New Orleanian. An irony not lost on those taking time off from work and their lives to deal with a broken system. As the week began, Mayor Cantrell booted S&WB leadership. A good first step. The first of many, if this fiasco is ever going to end.